Chef Eli Markshtien shares Israeli family recipes. When Eli Markshtien, wife, Laurel and family, moved to Birmingham he could not find an Israeli restaurant. So he opened Eli’s Jerusalem Grill and began cooking his grandmother's recipes. The eatery was an instant success with people of all cultures and those who want to eat organic. GianMarco’s salt crusted whole fish boasts exciting presentation. Today I am in the kitchen with Giani Respinto, co-owner of GianMarco’s Restaurant. Respinto shares his recipe, knife skills, fish buying tips, and humor while making whole, baked, salt crusted, Mangrove snapper with Italian salsa verde. Chef Chris Hastings shares a popular OvenBird recipe. Today I am in the kitchen with executive chef, Chris Hastings at OvenBird. Hastings is preparing a popular seafood fideos (Spanish for noodle - a short cut vermicelli) recipe. Vino’s Al Rabiee shares Mediterranean fish and pilaf recipe. I fell in love with this delicious dish at first bite. One night while sitting on the patio at Gallery Bar 1930, Matthew Rabiee brought me a taste of a dish that his dad, Al had just cooked for their family. It was a divine snapper and rice pilaf, bursting with Mediterranean flavors. I asked Matthew for the name of the dish, and he did not know. And given it is also not on the menu at Vino, Gallery Bar’s sister restaurant, I decided I must have the recipe to make at home. Pack a picnic with Village Tavern’s deviled eggs. Summertime, and Village Tavern’s Corporate Chef, Mary Grace Viado makes the cooking easy. She shares her recipe for pimento cheese deviled eggs. They are prefect for a summertime picnic or family gathering and pair well with Village Tavern’s Cubano Sliders. Chef Tom Saab shares Bistro 218’s West Indies Salad. Can’t cook? No sweat. Prepare Bistro 218’s West Indies Salad without a stove. “This salad originates in Mobile Alabama and is our homage to Alabama cuisine,” Chef and Owner, Tom Saab describes. Bistro 218’s version of West Indies Salad adds the tasty additions of aioli and tomato to the traditional recipe. Yet crab remains the star of this dish with its delicate flavor shining through. “When cooking with crabmeat at Bistro 218 we strive to not mask the flavor with seasonings or fat.” And he achieves excellence in this delightful dish. Bistro V’s cioppino is 20 years in the perfecting. Bistro V’s executive chef, Jeremy Downey finds cioppino to be the “world’s best dish.” And after tasting his, I cannot argue. He and I share a love of tomatoes, seafood, spicy heat, and wine—all of which are important components of this dish. As a native of Bayou La Batre, Downey has been cooking and perfecting his cioppino for 20 years. “Cioppino is an expression of me. And today’s is the best one I have ever made,” he describes. Bare Naked Noodles’ Linda Croley shares egg pasta recipe. Entrepreneur and chef Linda Croley originally rolled out Bare Naked Noodles as a ready-made pasta meals and sauces business. Her products are made of local and Italian ingredients and are sold at many farmers markets, local grocery and food specialty stores, as well as being served in some of Birmingham’s best restaurants. In 2015 Croley expanded the business by opening a café in Hoover, where she serves breakfast and lunch on weekdays. I stop by the café for lunch often. I especially enjoy the quiches and daily lunch specials, made of in season ingredients. Here I also pick up fresh pasta along with a jar of tomato basil sauce for dinner, on the table in five minutes. And I grab a few frozen dinners that I can pop in the oven anytime. Thus for many of us who are too busy to cook scratch meals using local ingredients, her business fulfills an important need. Or if you want to try your hand at making pasta, Croley shares her egg pasta recipe. Frank Stitt shares Fish Paillard with fig relish recipe. Today I am in the kitchen with Birmingham’s most celebrated chef, Frank Stitt. Stitt could have chosen to cook a dish that would show off his culinary skills to cook for us today. But instead he is cooking a simple, French fish dish, which we “at home cooks” can easily make. 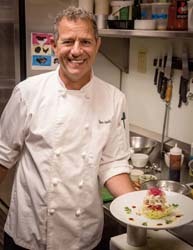 His Fish Paillard is served at Chez Fonfon and at Highlands Bar and Grill, which Stitt owns with his wife and business partner, Pardis along with their Bottega Café and Bottega Restaurant. Chef George Reis prepares Alabama oysters at 5 Point Public House Oyster Bar. Chef George Reis has shucked many an oyster at Ocean Restaurant. But today we are shucking and frying Alabama oysters next door at his new restaurant, 5 Point Public House Oyster bar. Here Reis serves his succulent oysters with two special touches, his own house made hot sauce and house made crackers. Giani Respinto shares secrets to GianMarco’s grass fed steak. GianMarco’s Restaurant recently added 100% Grass Fed, Joyce Farms beef to the menu. No hormones, antibiotics, animal by-products, grain, nor GMOs are ever fed to Joyce Farms Naked Grass Fed Beef. GianMarco’s serves this scrumptious steak with Brussels sprouts and Rigatoni Quatro Formaggio as a dinner special. And in the pasta dish Respinto uses Italian and French cheeses also from pasture-raised dairy. Galley and Garden’s James Boyce demos scallop and corn nage. Executive chef James Boyce prepares Maine diver sea scallops and local corn nage. And it is such a beautiful day that we decide to cook it on Galley and Garden’s patio, surrounded by their garden. Three Generations share Silvertron Café’s kitchen. The kitchen is the heart of each Italian home. And in The Silvertron Café’s kitchen, we get a taste of what it is like to be part of an Italian family. Cooking with chef Marco Morosini today are his daughter, Nora and his mother, Pinuccia Invernizzi—who is here on a visit from Lecco, on Lake Como in Northern Italy. And cooking with his mother makes more than a marvelous meal. It also stirs up some precious memories. “Every Sunday, right after breakfast, Mom started cooking. She cooked all morning long for a meal that wouldn't last more than 20 minutes!” he recalls. “It wasn't until I left home for the first time and moved to Paris that I realized what I had left behind. Then I started to really appreciate the time I had spent watching my mom and my grandmother in the kitchen. 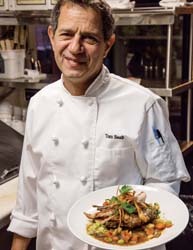 Bistro 218’s Tom Saab shares a super food recipe. Hot and Hot’s Chris Hastings shares healthy fish dish. A popular New Year’s resolution for 2015 is eating GMO free. And once again Hot and Hot Fish Club is on the cutting edge—being a GMO free restaurant already. Today Chris Hastings shares his non-GMO and organic pan seared Pompano dish. This entrée is made with Sunchoke puree, crones, Swiss chard and forged oyster mushrooms. Village Tavern’s Corporate Chef Mary Grace Viado Howard shares recipes. Mary Grace Viado Howard is the Corporate Chef of all Village Tavern restaurants. So she gets to choose which location to call home. And she chose Birmingham—many years ago—and has lived and worked here happily since. The Birmingham location is at the lower level of The Summit and is open for lunch and dinner seven days a week, and brunch on weekends. Today she shares her scrumptious, scratch made, fish and chips, along with her recipes for coleslaw and tartar sauce. Bistro V’s Jeremy Downey demos braised short ribs. I often dine at Bistro V for the fish of the day. It is consistently marvelous. Grouper, snapper, and any Gulf Seafood in the hands of executive chef Jeremy Downey—native of Bayou La Batre—never disappoints. Yet with today’s dish we discover that Downey’s culinary talents are wider than the sea. His Braised Short Ribs are also a favorite of many at Bistro V. Bistro V is co-owned by Downey and his partner, Emily Tuttle Shell who serves as general manager. Chris Hastings celebrates undiscovered delicacies of the Gulf Coast. Hot and Hot Fish Club’s Chris Hastings never settles for the status quo. And he has a new source for seafood—the “bycatch” of line caught, wild, Alabama seafood. Ocean’s George Reis prepares Thai Green Curry Bouillabaisse. Chef George Reis is always innovating the cuisine at his restaurants, Ocean and 26. And today he shares one of his cutting edge dishes, which incorporates a variety of seafood—Thai Green Curry Bouillabaisse. At Ocean this dish is served in a Tagine, Moroccan cooking vessel. And when the top is removed at the table, a steamy cloud of aromas whets the appetite for the first, succulent bite. Chef Tom Saab demos Bistro 218’s delectable duck confit. A very important part of my work as a food writer is… eating the food. And no matter what is put before me, with the exception of mushrooms/fungi that I am allergic to, I eat it. Through the years my palate has developed an appreciation of foods that I previous thought I did not “like.” Duck was one of those foods. I struggled to enjoy duck, even when prepared by the best of chefs. Yet today there was no struggle. Bistro 218’s Duck Confit, paired with a glass of Chateau Mirambeau, is not only the best duck I have ever tasted, it changed my former mindset about this bird. I loved Saab’s duck so much that and look forward to having it again soon at Bistro 218, where it takes him three days to prepare this classic French dish. Cantina’s Jorge Castro cooks big flavors in small space. Since Cantina opened the Shrimp Quesadillas have been a favorite dish. And today in “The Miracle Kitchen” here at Cantina, we learn the secrets that make them so good. And one of the secrets is the kitchen itself—where so many cooks create so much greatness in a small space. Vino executive chef, Becky Rabiee prepares one of the restaurant’s favorites. Good chefs evolve their dishes with the seasons, and incorporate the best and healthiest ingredients possible. Accordingly Vino’s executive chef, Becky Rabiee has tweaked their popular daily seafood special to a lighter version, which includes fresh baby spinach—rather than pasta and sauce—and includes the best, fresh and organic products she can find locally. Sol y Luna’s Alex Castro prepares a light and lean new dish. Executive chef, Alex Castro sears a new dish at the new Sol y Luna—Yellowfin Tuna with jicama tostada, topped with watermelon and mango salsa and spicy chipotle creamy sauce. Bistro V’s Jeremy Downey demos baked black snapper, Mediterranean style. As native of Bayou La Batre, Alabama, Bistro V’s owner and chef, Jeremy Downey knows seafood. Today he is cooking whole, Gulf Coast Black Snapper with house made Ragu. “Black Snapper is a cousin to Red Snapper. It is smaller in size, swims at 50 to 75 feet, and has a sweeter taste,” Downey explains. Village Tavern’s Mary Grace Viado demos a tasty classic. Mary Grace Viado is the corporate chef for all Village Tavern restaurants. Thus she could choose the make her home in any of 10 cities where Village Taverns are located. Yet Birmingham is her choice of home—where she is also the Village Tavern, Birmingham’s executive chef. Viado shares her secrets for a Southern and Village Tavern favorite, Shrimp & Grits. View Chef Video! GianMarco’s fresh pasta and tomato basil sauce is simply delicious. Everybody loves fresh, homemade pasta. GianMarco’s Giani Respinto demos fresh fettuccine, plus a simple sauce. Try this at home. Chris Hastings prepares Hot and Hot Chicken Pasta. I have an ongoing, and well publicized, love affair with Shula's Flash Fried Lobster. After covering it in Birmingham magazine's "One Dish" column and in "The Birmingham 100" for 2008, I am back for more. Today I want to learn the secrets of how executive chef of both Shula's Steak House and The Wynfrey Hotel, Rick Daidone prepares this wonderful dish. Frank Stitt shares handmade pasta technique and recipe from new cookbook, Bottega Favorita. Bottega Restaurant is famous for its handmade pasta. Now you can make it too with a little help from Frank Stitt. "People think that homemade pasta is too much trouble. But you just have to try it a few times to learn." Hot and Hot Fish Club's Idie Hastings shares pickled okra recipe and techniques. Pickling is a food preservation method that originated from the need to preserve out-of-season foods for long journeys, especially by sea. But the method survives today because people enjoy the resulting flavors. And okra-also known as lady's finger-is a popular vegetable for southern pickling. George Reis shares his secret seasoning and grilling technique for lobster tails. The hickory wood fired, grilled baby lobster tails at Ocean and 26 are divine. They are consistently moist, succulent, and sweet. Executive chef and co-owner of Ocean and 26, George Reis shares his secrets. One secret is the art of building a hickory wood fire in a wood burning grill-and knowing how to cook on it. Another secret is "The Love," which is a seasoning that goes on every piece of grilled fish at Ocean. Chef Giani Respinto shares secrets for making GianMarco's risotto. To make a great risotto you need the finest of ingredients, proper procedure and eighteen minutes. "The combinations are endless, but the procedure never changes," chef Giani Respinto explains. "When Gianmarco's customers order our seafood risotto, they are told it takes 18 minutes to prepare it." The beautiful red-orange color of this drink in a simple martini glass is an elegant reminder of the holiday season. Each year, Chris and Idie Hastings, owners of Hot and Hot Fish Club, enjoys hosting a holiday Christmas party for their neighborhood. And their friends and family agree that the Blood Orange Martinis are the highlight of this festive affair. We always look for a variety of locally grown, heirloom tomatoes at our farmers' market. If heirlooms are not available, we opt for ripe red tomatoes that are grown locally. The whole baby okra make for a beautiful presentation but if it is unavailable substitute the larger sized okra and cut them into 1/2-inch pieces before breading and frying. Hot and Hot Fish Club goes whole hog over Fudge Family Farms. Hot and Hot Fish Club's Chris Hastings is always in search of the best, local purveyors in an effort support the local economy and bring the highest quality ingredients to his guests. And Henry Fudge and his Fudge Family Farms are the latest addition to his family of purveyors. Award winning Belle Chevre artisanal cheeses make Birmingham menus. Real Food is a new column that debuted last month. It supports Birmingham's convivium of the international Slow Food movement. In a pecan shell, Slow Food is the opposite of fast food. It is grown or produced locally and arrives fresh, full of flavor.